Well, whatever else you may say of him, one thing stands out about Caravaggio: this guy could paint! 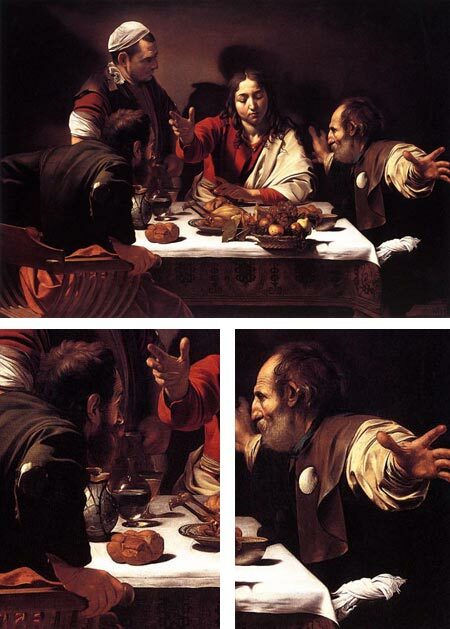 Look at his famous painting of the Supper at Emmaus (image and details, above). This is no glossed over, idealized religious scene, aglow with the unreality of poetic divinity, this a real scene with very real figures. Everything here is tangible, and rendered with the kind of palpable fidelity to life that got some of Caravaggio’s other works rejected as vulgar and secular. Look at the disciple’s hand on the chair in the foreground, the “instant in time” position as that figure is about to rise, the outstretched hand of the beardless figure of Christ and other disciple’s hands extended into space, suspended toward or away from us in dramatic foreshortening, the rich, dark shadows, against which the whites of the cloth pop forward, the tactile physicality of the food and plates on the table, rendered with as much care and emphasis as the figures themselves, the odd way one disciple’s elbow and the other’s fingertips are cut off by the edge of the canvas, and the striking realism of the faces, more portraits than idealized figures. What a tour de force of painting skill. What a show-off. What a painter! Though I can’t say I was unequivocally thrilled with last week’s showings of the PBS series The Power of Art (see my previous post), I will say that they were interesting and thought provoking and for that reason worthwhile. Tonight’s program will be on Caravaggio (10PM on most PBS stations), and it will be interesting to see which of Caravaggio’s faces the program chooses for its focus. There are many angles by which to approach Caravaggio; he was a pretty remarkable fellow in more ways than one. Take your choice. Anyway, I go for “all of the above”. I saw the Caravaggio exhibition last year in London and it was amazing. I saw all the paintings you’ve shown here. I saw this exact painting last Thursday – it’s very powerful. The gent on the right is always the one who catches my eye though……. I was so fortunate to see a grand exhibit of his work at the new UT museum in Austin in February. I agree! This guy could paint. Magnificent and I plan to watch PBS tonight. I also felt a little disappointed in “The Power of Art”. The entertainment factor so far, seems to be competing with its own content. A good documentary places the subject in the light without distraction or gimmicks. Which brings me to your delightful Dinosaur Tutorial. It is remarkably clear from beginning to end. 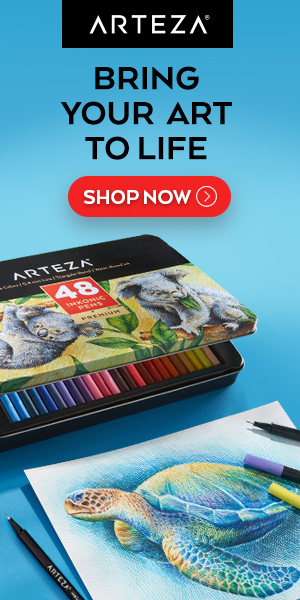 You smoothly incorporate some important principles of drawing such as starting with a sketch supported by geometry, and filling out the final form as a skin to the underlying shapes. It looks simple because it’s so enjoyable, but there is a lot covered in the tutorial. I like the nurturing and patient way you relate to your audience. You stay on track the whole length of the demonstration. Then after the T Rex’s figure is complete, we are rewarded with the finale. The pace quickens while filling in the wrinkles and scales. It was like the 4th of July. Instead of insisting where every dot and dash belong, we are reminded not to just copy, but apply these basic concepts to other subjects of our interests. I think kids and adults alike would find pleasure in this exercise, and start building confidence with these basic tools. I got a lot of pleasure out of viewing the tutorial, and the stagasaurus hard at work drawing makes me laugh every time. The Power of Art will be starting in 30 minutes. I’m looking forward to seeing this segment on the Renaissance. Caravaggio’s mastery is worthy of every century it passes through. Thanks for the nice comments about my How to Draw Cartoon Dinosaurs tutorial. I put a lot of thought and work into it and I did have the advantage of having conducted many similar live drawing sessions with kids at book signings, so I gradually learned how to get the concepts across. I do not agree that the concept of foreshortening which Caravaggio used was only matched by Buonerotti. I believe Da Vinci and Rubens also had the power the draw and paint limbs in a foreshortened way. Thanks for your comments. I’m not suggestiong that they were the only ones with a good command of foreshortening, simply that I think they were the best at it. Caravaggio’s extreme foreshortening is awesome in this piece. I came across a great book on him published by Phaidon “Caravaggio”by Catherine Puglisi. What is genuinely off-putting is Schama’s use of actors dressed up in period clothing going through the motions. Fortunately the use of this device is, for the most part, restrained and least offensive when the actors are in effect nothing more than background mimes to Schama’s voice-over story-telling. The episode in which an actor speaks a number of passages that van Gogh wrote but probably never really spoke aloud is the least effective. The most potent of these episodes so far has been the hour examining Picasso and, not coincidently, this is the episode that relies least on actors in the background. The sketches that developed into Guernica and the dual inspirations of Valezquez and Goya are succinctly examined and the camera lingers over Guernica’s details after we’ve learned the history of the village’s brutal destruction. It’s just the way you want to examine great art: with insights and anecdotes from a connoisseur. But let’s leave the costumed mimes outside on the museum steps. I agree. More camera on the painting, please; less melodramatic grimacing by actors, thank you very much. I found your views on Caravaggio very interesting. A few years ago I came across a professor who was pretty much convinced that Caravaggio as well as many other artists used the “Camera Obscura” to create their paintings, and that the realism aspect of their paintings was dramtically improved by this invention. I use digital camera images for my work, and have projected slides onto watercolor paper and lightly trace what I want, to form the basis of the painting. I spend hours refining the drawing to my satisfaction before starting the painting. Don’t get me wrong, I can draw quite well without this process, I just find that it is a very useful tool that makes the whole creation process easier and faster. I would be interested in comments on this Camera Obscura theory. Yes, I noticed the hand proportion as well, and use of a camera obscura may explain that, though Michelangelo’s David, for example, has oversize hands and a extra large head (even for a young man), and I don’t think there’s an issue of optical projections there. I haven’t had a chance to read Hockney’s book, so I’m not in a good position to comment on it. If he is merely suggesting that these artists employed optical devices, I think they probably did; artists have used every technique at their disposal to create better pictures, grids, cartoons, measuring and sighting techinques of all kinds, and, of course, linear perspective. I have no problem with that, any more than I have any probelm with the use of photographic reference. If he is, on the other hand, suggesting that the use of optical devices was necessary for these painters to achieve their level of skill, and was somehow responsible for their accomplishments, I will laugh in his face, because that’s simply absurd. It’s almost certain that Vermeer used a camera obscura. If Hockeny can use a camera obscura (or 21st Century photographic and projection techiques if he wants), and paint me a Vermeer, I’ll eat it. Another important element of his composition not mentioned here is the positioning of one of the platters slightly over the edge of the table which dramatically adds tension to the scene. ‘The Supper at Emmaus’ by Caravaggio, had a lasting effect upon me when I visited the National Gallery last summer during my sabbatical. It was one of those defining moments. While listening to a piece of music my emotions are quickly engaged, but up to this time, art hadn’t effected me in the same way. It was while looking at this painting for a prolonged period that something changed. It was something to do with the centrality of the beardless Christ, the effect of darkness and light, the reaction of the disciples, the contrasting passivity of the servant, the sense that the fruit bowl is about to drop off the side of the table, the chair is being pushed back, the hole is about to develop in the elbow of the sleeve, the hand is coming out of the painting at you, and the way that I was invited into this action on the vacant side of the table. But it was more than all this. I think what did it was hearing a guide explain to a party, with what I conjecture was more than just an enthusiasm for the painting, that this is a freeze-frame, a split second before Jesus disappeared from their sight. I was profoundly touched.